Own one of the premier pieces of land in all of Costa Rica. This prime and rare estate property is one of the best-kept secrets on the Pacific Coast and is a paradise bordering a river and mangrove that has boat access and expansive verdant valley rimmed on both sides by lush forest leading out to the pacific edge offering stunning views, and extremely private! With over 1600 acres of private estate land with over 3.5 kilometers of TITLED BEACHFRONT, this property is perfect for a large private estate, development or subdividing into several smaller pieces. Access is excellent and a picturesque breathtaking paradise. This is a very rare piece of property and if you are familiar with what TITLED BEACHFRONT means, then you understand this extraordinary opportunity. 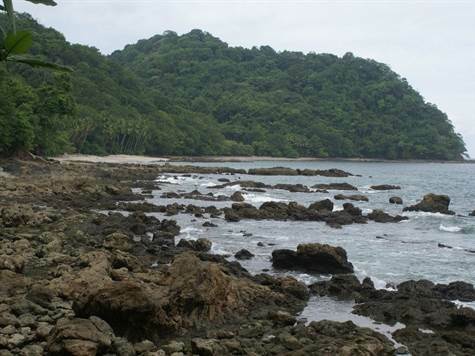 This is one of the largest titled beachfront properties in all Costa Rica. Currently in the planning process to include commercial center, two strategically positioned hotel sites, areas for golf course, several uniquely designed residential sectors with 2,000 units, an eco-adventure facility, canopy activities, ecquestrian center, and so much more… Much careful thought and planning taking all the precious elements into consideration to create a community like no other! Definitely a jewel that sets itself out in front of all the others, and extremely exiting elements that you must come and see for yourself! Do not miss out on this extraordinary opportunity! Tambor is set in the valley of a large and calm horseshoe bay: the Bahia Ballena which in English means whale bay. During dry season these giants of the seas used to come into the bay. Nowadays with the increased coastal activity whales no longer frequent the bay of Tambor. The beach of Tambor is easily accessed with a car and you find shade under almond and palm trees. The volcanic history of the sand serves up a grey-colored beach which gently slopes into the bay. Low tide produces a broad expanse of fine sand where you can play beach volley ball and soccer. The shallow waters are exceedingly calm and offer good swimming for even the most timid of bathers. A local breeding program for scarlet macaws successfully re-introduced the species in the area around Tambor and sometimes you see flocks of these gregarious, large parrots foraging the almond trees on the Tambor beach. How to get there? Tambor has a local airstrip that offers several flights daily, there are paved access roads. There are ferry boats for cars and passengers that run every couple hours from Puntarenas that will land within minutes of the Santa Lucia, and the ride is approximately 1 hour and there is an 18 hole golf course, several boutique hotels, and endless hidden beaches and coves with islands scattered throughout within close proximity.